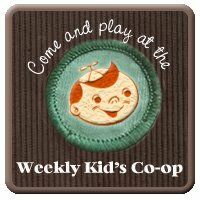 Hello and welcome to the Kid's Co-op Link up--the place for you to link up your kid-related posts and check out tons of fun ideas too. Each week I'll be featuring my favorite ideas here too. I'm a teacher, so I'm always on the lookout for some sweet teaching goodies that would work in the classroom. Just add your link below and if you link up, add this Kid's Co-op badge to your site to show your support. Thanks!